Friends don't let Friends go without a backup, take the World Backup Day pledge. - Sewelltech, Inc.
Friends don’t let Friends go without a backup, take the World Backup Day pledge. We’ve created more information in the last two years than in the entirety of recorded history. That’s a lot of photos, memories, and important projects to lose. Protect your legacy and backup your data. Creating a data recovery and business continuity plan is not just for major Fortune 500 companies. Creating a plan to handle any data loss or corruption event for your small business should a top priority. Losing that data can severely disrupt or even shut down your business. 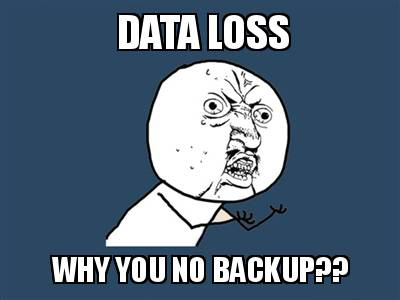 We recommend creating a comprehensive contingency plan to prevent and recover from any data loss catastrophe. Basically, it’s making copies of all the important information that you have to ensure that it won’t ever be lost or damaged. It’s not as hard as it sounds – in fact, it’s really simple! You might think your computer, phone or tablet is pretty reliable, but in reality, it’s not. Everything (yes, everything) fails, and once it does, all the important information you’ve stored on that device can be destroyed. In fact, it’s not a question of if a piece of technology will fail – it’s when. Backing up is easy. Once set up, your data should be backing up automatically. You just need to check every once in a while to make sure your backups actually work. Every week, copy your most important files onto an external hard drive next to your desk, in your closet, or any other place where you can easily retrieve it. You can even use Time Machine on your Mac to do this automatically! First, plug in your external hard drive. Then, follow the instructions below to start automatically backing up your Mac! **WARNING:** Make sure your new external drive is totally empty! Time Machine will usually *erase the drive* so it can do its thing. If this is a new drive and you’re okay with it, keep reading! Choose your external hard drive from the list and select “Use Disk”. You’re done! Your Mac will back itself up automatically from now on. If you’re using a MacBook, make sure to plug in your hard drive regularly so it can save your files! Another automatic backup or an external hard drive that’s stashed at another location, such as a bank vault, friend’s house or even in a data center in another state. This protects your backup in case of theft, natural disaster or simple hardware failure. Similar to an offsite backup, this involves simply installing a small app on your computer to instantly and automatically copy your files to the internet. This makes multiple copies of your files at various places around the world, making it hard to lose any of your files. It’s super simple and done instantly – you barely need to do anything! However, your backups can be a little bit of a pain to retrieve though (it’s a lot of stuff you have to download!) so having this option in conjunction with one of the above is a good, secure plan. Sewelltech’s Certified Apple Technicians can help you develop a safe and sustainable backup plan. First, we work with you to determine how often you need to backup your files. Then, we help you choose the right hard drive and software or off-site solution for backing up your data. In observance of World Backup Day, We are offering these one time special deals. What are you waiting on DON’T BE AN APRIL FOOL. Backup your files.